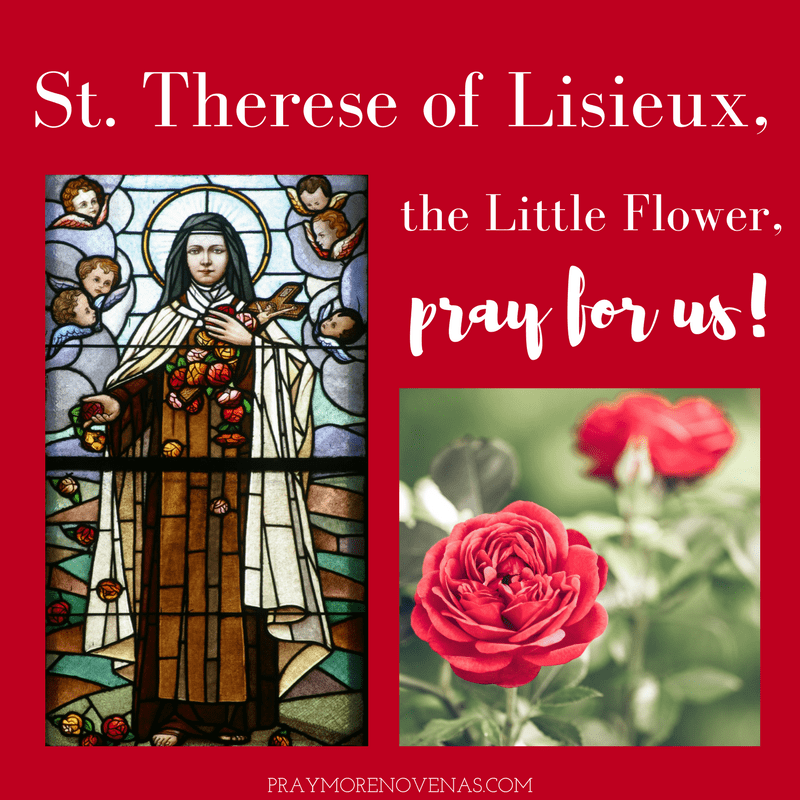 Here’s Day 1 of the St.Therese of Lisieux Novena! I am praying to St Theresa to intercede with my Son. He is so despaired with life and continues in constant negativity. Please help him to adapt to life changes and move on with his life. St Theresa I turn him over to your most comforted hands to help him find his way. I pray you help me settle my mind and take care of my family. Help me to be a better husband and father. I pray the Lord shows me the way to salvation. Please st Theresa pray for my 13 year old nephew Jamie. Jamie got tests did last week it showed Jamie had bone cancer in the knee Jamie is waiting on the results of a MMR scan to see did it go further. Please st Theresa please pray that it did not. And that he won’t have to get his leg remove. Right treatment leading him to obtain good health. st Therese pray for my family kids ,john ,Benedict and precious,may God open his blessing upon me ,send roses of blessings upony life,I’m so confused, hurted and betrayed.help me,pray for me may smiracle be done upon my life st Therese,kindly my debitors are many intercede for I need a job ,money to pay them and provide for my kids ,I can’t afford even shelter my kids kindly pray for me,intercede for me,st Therese.Amen Amen Amen. Dearest St. Theresa praying for your intercession on my house rent and a good person to rent one room to its too much for me now, I need a choce a person to rent to help me with your intercession. Am trusting in your promise to do good while in Heaven here am i hoping. Am under persure now for the rent and who to take in as to rent the one room. I am praying that my dad’s doctor appt. goes well and that some test results come back clear so that he can have that maintence drug on Saturday! Dear St Therese, I pray for my friend ML that he’d get some relief from the pain caused by cancer. And if it’s Gods will that he may be healed completely. I also pray for myself that I’d be healed of all the physical and spiritual disabilities that afflict me. God bless all those responsible for providing this wonderful opportunity to pray novenas with thousands of others. I pray that everyone praying these novenas will find their prayer-life deepen, and that their needs are being fully met because of the intercession of all the saints, beginning with Out beautiful Mother Mary. Thanks be to Her Son The Lord Jesus Christ. AMEN! Pray for John, Lee, David, Josh, Jeff, Michael, Jim, Chris, Robby and Kenny and Geoff, Noel, Jaba, Ursula. Pray too for my Moslem acquaintances, that they may seek Christ through my deeds of love towards them. St. Therese, thank you for your prayers and heavenly love for all of us who are praying this novena, for all our loved ones and all our intentions. With your help, and because of God’s merciful goodness, we can trust that our prayers will be answered in the best possible way. In this novena, my hope is to meet those persons who are meant to join us in our project and become the core group of friends and family who will work with us to accomplish our aims, for the glory of Our loving Father. Little Flower, please pray that our relationship continues to blossom if it is God’s will. Continue to pray for me. Give me courage each day. Please intercede for my son and his upcoming final court dates may Our Dear Lord have compassion on him and if possible spare him from any jail or prison time. Please intercede for my family and any difficulties we might be going thru and for everyone in this novena group and any other prayer group that have joined me in prayer. For my daughter who is suffering from extreme anxiety. St.Theresa of Lisieux, please intercede through our Lord Jesus Christ, that the stomach pain I have been suffering should be healed. I should be free of this pain and be healthy. Please also pray that I should find a satisfying job soon. Please.pray for our imperfect president. I believe he is trying to do good. I pray for removal of doubt and peace with my relationship with my husband. Please pray for my son that he would be safe always especially in coming home happy .Please pray for my youngest son & my daughter that they are always be guided by the Holy Spirit in ecerything they do & keep them safe always . Please pray for the health & happiness of my husband ,my brothers , sisters & my friends and also for those who needs prayers . Guide us always.Thank you so much ,Saint Therese .Please tell God Jesus ,Mother Mary , Saint Joseph & all the angels & Saints that i love them more & more . Thank you! Please pray for me to overcome financial difficulties and to be able to move to a more suitable accomodation. Please pray for my husband, my family, and my current health crisis. For healing, peace, and love. For release of addictions. To know and accept God’s plan for my life. Especially in regards to my career path. For my daughter’s, KAM, health to be restored, for her doctors to have the wisdom to find the cause of her irregular heartbeat and multiple symptoms, and for their ability to care for her accordingly so that she may lead a healthy life of faith, love of friendship and family, and serenity while completing her college education. Please pray for my brother who has kidney failure and desperately waiting for a donor and increase his own weight. Please pray for me to win millions of money and hear a tel call from the organization . Would like help my brother pay for transplant and help my poor family members. Please pray for the miraculous healing of a little boy named Conan, who has a congenital heart defect which requires repeated heart surgery. Please pray that he will no longer need any surgeries and that his heart and blood vessels will become normal. Pray that through this miracle, his parents will be led to come into the Church and be fulsome in their praise of God and His goodness and works. Please help my brother find a permanent job. Help my son get his nursing license back, & that he can get all of his debts in order. For all of my family that has fallen away from the church, that they may return & start receiving the scaraments. For my husband & I, that we may be able to get our marriage blessed & be able to receive the scaraments. For my husband, that he may find it in his heart to forgive his sister. To remove the deep-seated hatred and grudge that darkens space in my heart. For Diane Dorian, Lisa Ronald. St. Therese, please present these intentions to our Heavenly Father. St. Therese please intercede for my intentions, especially for my sister. I’d like to pray for my son-in-law that he will start the RCIA program, he goes to mass, plus my oldest granddaughter, his daughter gets confirmed in this coming spring. St.Therese please help me guide me blessed me for my incoming nursing board examinations on Nov 17 and 18 2018..Blessed me to fullfilled my dream to be the topnochers with the average of 88%..Give me more knowledge and wisdom I can concentrate while I’m reviewing. Amen. Dear God I pray for financial freedom as I seem to be drowning in debt. I pray for your hand upon my daughters so that they may be true godly children and that they take their schooling seriously. That they may pass their grades now in 2018. Pray for Christopher to have a happy and focused year in school. Heal all depression and suicidal thoughts. Reach into our hearts Lord & help us to love each other as you love us. Please know you are not alone.. I will pray for you!! Please St Therese pray for my daughter who has left the church to come back to Christianity and my son and other daughter to return to actively practice in church and for me not to loose hope. Praying my sister’s chemo is successful to eliminate all cancer in her body and she is restored to full health. Dear St Therese, Please pray with us for holy, faithful, faith-filled Priests, Religious, and Lay People, that we will fulfill perfectly the mission our God created us to do, so we won’t have to go to Purgatory. Thank you. Please pray for my daughter DANIELLE Forman to get the right New Grad RN position to learn and develop her nursing skills. She wants to work with pediatrics and ultimately get a RN position with Children’s Hospital in Boston. Please St Theresa help me to regain my confidence today. Help me to become a more loving wife. Bless all my family with health especially David who sees specialist next week. In the name of the father. Amen. St Therese please pray for our Catholic Church. May all your Prayers be answered in Jesus Name.